We have over 100 croquet members playing on five excellent full-size (35 yards by 28 yards) croquet courts that are among the best in the country. The croquet season starts towards the end of March and continues well into October. We now keep some of our courts open throughout the year as the option to play outside of the main season has proven popular with our members. Both Association Croquet and Golf Croquet are played at the Club and are enjoyed by all levels of ability. If you haven’t played croquet before, please look at the following first. There are two versions of croquet: Golf Croquet is the simpler game, probably more familiar to those who have played croquet casually; Association Croquet is a more complex break-building game, perhaps more akin to snooker than anything. Both are played with the same equipment (hoops, balls and mallets) and the same court layout. The Croquet section of EDLTCC has over 100 members playing on five full-size courts that rate among the best in the country. The croquet season starts about the end of March and carries on well into October. 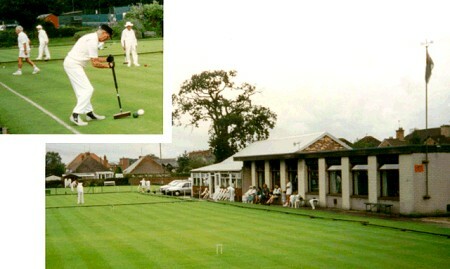 Both Association Croquet and Golf Croquet are played at the Club, and are enjoyed by players at all levels of ability. The Club hosts national and international croquet events, including the Western Championship each May and often one of the national ‘Eights’ competitions (for top players in the country) toward the end of the season. The Club enters teams in national competitions as well as several South-West Federation leagues that cater for players of all abilities. In addition there are several open tournaments, attracting players from all parts of the country, supplemented with Club competitions running throughout the season, including weekend events. Club sessions are held weekly for both Association and Golf Croquet, where games are arranged for players or alternatively some form of coaching is provided. Members may arrange games with each other at any time (except during tournaments) from 9.30am until dusk. Light-coloured clothing is preferred, though ‘whites’ are generally required for tournament play. Flat-soled shoes without a heel or ribbing are a must. During the winter two lawns are kept open, and throughout the year social events are held, which are well attended.